building automation and process/access control systems. Multiple protocols are supported including LonWorks, ModBus/485, ModBus/TCP, BACnet/IP and BACnet MS/TP. It uses flash memory and runs on Linux. Programming is browser based and easy. Features include animated graphic screens, scheduling, historical trending, run time accumulation and alarm monitoring. All features are supported, even with devices that do not natively support them. 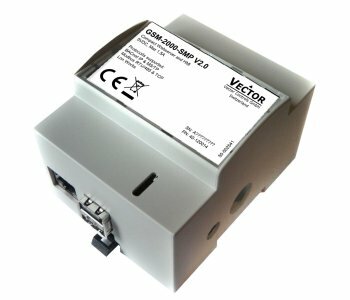 GSM-2000-SMP will automatically toggle outputs and change setpoints on schedule, collect runtime and trend data, and monitor alarm conditions. GSM-2000-SMP uses Flash memory for internal storage. It contains no hard disk or other moving parts. The Linux operating system is used for enhanced security and stability.